So what do these chimpanzees eat? Conclusions about paleolithic diet myth? Some vegans, to contradict the lack of evidence that ancient humans, or our ancestors, were 100% vegetarian, will then make a claim that humans “evolved” to be more vegetarian over the past few thousand years as we moved to an agrarian based culture, but that ignores the fact that evolution does not work that quickly on a species that has such a long lifespan and such a low population. There just is no scientific evidence that we evolved to be an exclusively vegetarian species. Almost on the opposite end of the diet fad spectrum, the paleolithic diet, which is based on the supposed ancient human diet of wild plants and animals that various hominid species habitually consumed during the Paleolithic era, has become one of the more popular diet fads of the past few years. The diet consists mainly of fish, grass-fed pasture raised meats, vegetables, fruit, fungi, roots, and nuts, and excludes grains, legumes, dairy products, salt, refined sugar, and processed oils. It really attempts to be scientific (much more so than some vegan claims), but it seems to border on the edge of pseudoscience, and can be considered a vogue diet, without much science backing it. Maybe its a good diet for health (we have no real evidence supporting it), but is there any evidence that our paleolithic ancestor actually ate a paleolithic diet? Clearly, real science can provide us with strong clues and evidence as to the sources and quality of foods eaten by ancient humans (and their relatives). It is fairly straightforward to determine what our ancestors might have consumed, just based on a quirk of plant photosynthesis. Stable isotope analysis can measure the 12C/13C ratio, which is useful because different organisms have different ratios depending on what organisms they ingest. Importantly, plants have different ratios based on the type of photosynthesis they use to fix CO2. Plants that use C3 photosynthesis (mostly trees, shrubs and herbs) don’t select for one type of stable carbon over the other, so the 12C/13C ratio in these plants is the same as the ratio of carbons in the natural environment. An analysis of the 12C/13C ratio in Australopithecus afarensis, a hominin (apes that include humans and their immediate ancestors that split from chimpanzees, about 5.4 and 6.3 million years ago) from the middle Pliocene (3.0 to 3.7 million years ago) showed that it had already shifted to a C4-based diet, that is, it had already made the switch to grains. Another paper showed that hominins made the shift to the C4-based diet around 2.3-1.2 million years ago, which coincided with the retreat of heavily forested areas that were replaced by open savannah. A third study, which analyzed stable isotopes to investigate the diet of several species of Theropithecus, the ancestors of the modern gelada baboon (a grass-eating ape that lives in the highlands of Ethiopia). The results showed that Theropithecus species almost exclusively ate C4 plants, similar to the diets of the modern gelada baboons. In a recently published review article, the authors hypothesized that large brains and upright walking are two of the main factors that distinguish humans from other primates. However, a third significant factor in distinguishing humans from other apes may be a shift in diet from leaves to grasses. As ancient hominims left the forests and ventured into new habitats such as grasslands, they had access to more diverse food sources than found in forests (where most primates have stayed). Researchers are just beginning to understand what ancient humans ate, and these recent studies show that grasses and grains have been part of the human diet for millions of years. Coincidentally, in a recent article in Scientific American researchers described how chimpanzees eat in the wild. As a bit of background, chimps and bonobos (subtribe Panina), diverged from the line that lead to humans about 5-6 million years ago, but they still share about 97% of their genetic material with humans. There is robust evidence (pdf) that the chimpanzee diet can be used as a proxy to early hominin dietary preferences in the wild, while correcting for a few million years of intervening evolution, including the hominin migration to the grasslands. But chimps certainly can be used as a rough estimate of our ancient diets, prior to the move to a C4-based diet. Diversity—The Kibale chimpanzees consumed around 102 species (and possibly many more) of plants either in the form of fruit or leaves. I don’t mean to be picky, but how many species of plants are in your local Whole Foods? And 20 different varieties of apples is still one species of apple. Human ancestors, in a planet with limited food resources, probably were just as fungible with their choices in plant foods as chimps. Modern humans just aren’t. Figs—Nearly half of all of the food consumed by chimps appears to be one or another kind of fig, fruit of the Ficus trees. Fig trees produce large amounts of fruit that are favored by a number of animals including most primates (including gorillas and many human cultures) and fruit bats. They are highly nutritious and contain a lot of energy, and have a wide number of ecological niches so that it would be distributed throughout the chimpanzee habitat. Early humans would have also found figs throughout their habitats in Africa, and figs were domesticated about 10,000 years ago, and have been a significant part of human agriculture in certain societies. It’s clear that along with increasing the number of plant varieties in our diet, we need to seriously increase the quantities of figs. 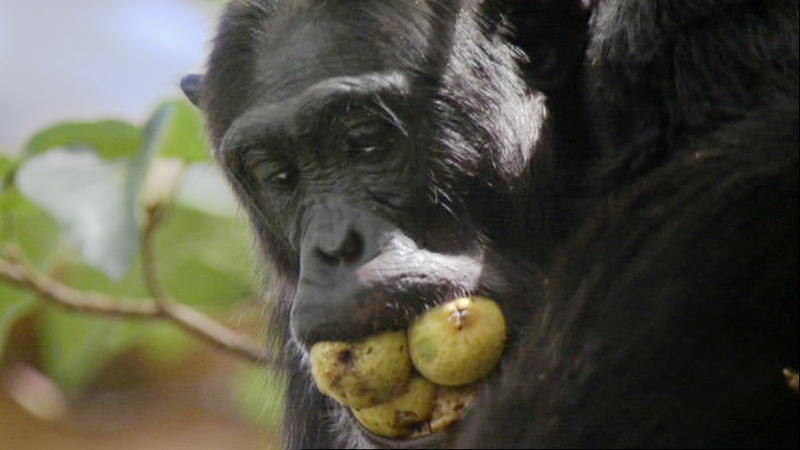 Clumps—Chimps eat a wide variety of fruit throughout the year, but only eat one or two species of fruit at one time. So they might eat apples one day then oranges the next. So, they may eat what is “in season” or what is available. Many plants fruit seasonally, or even just for a few days, so the chimps eat what is available. There are a few continually fruiting plants, but they are rare, even in the tropics, so the chimps choose what is available. Meat–Although we focused on fruits and plant foods, chimps do eat meat, and are considered omnivores, just like their closely related cousins, humans. Chimps favor eating seven kinds of primates, including their favorite, red colobus monkeys along with three other mammal species. However, only 3% of the average chimp diet comes from meat. Given the availability of high energy plant foods, the energy expenditure required to acquire mammalian food probably is too high unless it’s easily obtained. Variety—One of the myths of our ancestral diets is that our ancestors ate some imagined ideal diet for their bodies. The observation of the chimp diet is that there isn’t an ideal diet, and they eat what they find. Even though figs are a significant portion of their diet, when they find no figs, they don’t eat figs, and change to something else. Some chimps eat more mammal meat than others, if that meat is available, not because of some evolutionary advantage to do so. The authors determined that although some species must eat a specific mix of foods to survive; chimps (and man) are not one of those species. Termites and ants (and their chitin)—Some chimps are good at eating termites, honey bees and driver ants. It’s unclear if chimps have any special ability to digest the chitin (exoskeleton of insects), but insects do have a lot of energy content. Again, chimps seem to have a broad choice in foods, and eat almost anything that is available. Other–Chimps at Kibale ate dirt. Gorillas eat wood and the occasional stone. No one knows why they do this, but it to the apes of Kibale National Park, it’s good stuff. So, if you want to have an ancestral diet, apparently you have to open your mind to food sources that aren’t just plants and animals. Before we head to the conclusions from this article, one thing is important-figs. Really, we almost have to wonder if primates would not have evolved without figs. That fruit is a critically important part of the chimpanzee diet, and, given the ubiquity of the plant, we must presume that it was also critical to early Hominims that evolved into modern humans. Figs were domesticated for agriculture fairly early in modern human history, so it must have some importance. The paleolithic diet itself probably has no more validity than any other diet (lots of anecdotal evidence of success, and no actual scientific clinical studies). The problem is that there is little evidence that ancient humans, hominins and other great apes ate a particular diet. Clearly, the diet of early humans (or great apes) probably was in response to significant seasonal, annual and longer duration environmental variability in food sources. Keep in mind that we haven’t even considered the difference in food sources over the planet from Arctic tundra to deserts. But more than anything, is there any evidence that paleolithic humans lived longer or healthier than modern humans? Well, actually the Paleolithic lifespan was around 33 years, whereas modern man is around 67 years (varying from country to country). Much of the increased lifespan is more than just food (white privileged Europeans rarely starve), but also we have better hygiene, sanitation, medicines, vaccinations, and probably, better nutrition. That allows us to live longer and healthier. So let’s move on from the the paleolithic diet myth (based on paleontological evidence), and just look at the diet on its own merits. In one review, the authors concluded that “The Paleolithic diet resulted in greater short-term improvements in metabolic syndrome components than did guideline-based control diets.” Even though it is a meta review, which I consider to be the highest quality published research, it is based on only 4 randomized clinical trials with a total of 159 patients. That’s just tiny, thus, the errors were so large that the study may not tell us anything. In another review, which appeared to be favorable to the diet, the authors discussed the lack of evidence that supports the Paleolithic diet. Maybe the diet works, though not because of the myth that our ancestors from millions of years ago ate this diet. Of course, a big fat steak on the plate probably wasn’t amongst their diet choices. 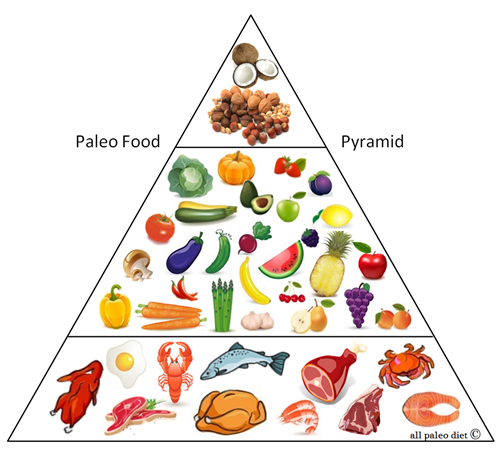 It is probably impossible to define a standardized “paleo diet”, since our ancestors shifted to grains (a no-no in the paleo diet faith) millions of years ago, and because humans are intelligent, so obtained whatever food sources were handily available. Undoubtedly, there are aspects of our modern diet that are unhealthy, like too much processed foods. And maybe the so-called paleo diet is a significant (though expensive) improvement in our diet, though the science is kind of weak right now. Our bodies are what they are, thanks to millions of years of evolution. There is little you can do to your body with food (except for those figs, I suppose), so you take advantage of what food is available to you. You’re not going to live longer if you eat something or another. You’re not going to prevent or cure cancer. Don’t eat more than you burn is about the best advice you’re going to get. If you think that a paleo diet represents some idealized diet of our evolutionary ancestors, it probably isn’t, which may not be relevant if there’s scientific evidence that it improves health. It’s an invented diet (again, irrespective of it’s actual clinical usefulness), and imparting some greater characteristic than that is not very scientific. The paleolithic diet myth really is unsupported by real scientific evidence, hence, we call it a myth. On the other hand, if we can ignore the lame justification for it, maybe we’ll get evidence that it is healthy. Two different issues. Editor’s note: This article was originally published in July 2013. It has been updated to include more comprehensive information, to improve readability and to add current research. Cerling TE, Chritz KL, Jablonski NG, Leakey MG, Manthi FK. Diet of theropithecus from 4 to 1 ma in kenya. Proc Natl Acad Sci U S A. 2013 Jun 25;110(26):10507-12. doi: 10.1073/pnas.1222571110. Epub 2013 Jun 3. PubMed PMID: 23733967; PubMed Central PMCID: PMC3696767. Cerling TE, Manthi FK, Mbua EN, Leakey LN, Leakey MG, Leakey RE, Brown FH, Grine FE, Hart JA, Kaleme P, Roche H, Uno KT, Wood BA. Stable isotope-based diet reconstructions of Turkana Basin hominins. Proc Natl Acad Sci U S A. 2013 Jun 25;110(26):10501-6. doi: 10.1073/pnas.1222568110. Epub 2013 Jun 3. PubMed PMID: 23733966; PubMed Central PMCID: PMC3696807. Katz DL. Pandemic obesity and the contagion of nutritional nonsense. Public Health Rev. 2003;31(1):33-44. PubMed PMID: 14656042. Manheimer EW, van Zuuren EJ, Fedorowicz Z, Pijl H. Paleolithic nutrition for metabolic syndrome: systematic review and meta-analysis. Am J Clin Nutr. 2015 Oct;102(4):922-32. doi: 10.3945/ajcn.115.113613. Epub 2015 Aug 12. PubMed PMID: 26269362; PubMed Central PMCID: PMC4588744. Pickering TR, Domínguez-Rodrigo M. Chimpanzee referents and the emergence of human hunting. Open Anthropology Journal. 2010;3:107–113. Sayers K, Lovejoy CO. Blood, bulbs, and bunodonts: on evolutionary ecology and the diets of Ardipithecus, Australopithecus, and early Homo. Q Rev Biol. 2014 Dec;89(4):319-57. Review. PubMed PMID: 25510078; PubMed Central PMCID: PMC4350785. Sponheimer M, Alemseged Z, Cerling TE, Grine FE, Kimbel WH, Leakey MG, Lee-Thorp JA, Manthi FK, Reed KE, Wood BA, Wynn JG. Isotopic evidence of early hominin diets. Proc Natl Acad Sci U S A. 2013 Jun 25;110(26):10513-8. doi: 10.1073/pnas.1222579110. Epub 2013 Jun 3. PubMed PMID: 23733964; PubMed Central PMCID: PMC3696771. Tarantino G, Citro V, Finelli C. Hype or Reality: Should Patients with Metabolic Syndrome-related NAFLD be on the Hunter-Gatherer (Paleo) Diet to Decrease Morbidity? J Gastrointestin Liver Dis. 2015 Sep;24(3):359-68. doi: 10.15403/jgld.2014.1121.243.gta. Review. PubMed PMID: 26405708. Watts DP, Potts KB, Lwanga JS, Mitani JC. Diet of chimpanzees (Pan troglodytes schweinfurthii) at Ngogo, Kibale National Park, Uganda, 1. Diet composition and diversity. Am J Primatol. 2012 Feb;74(2):114-29. doi: 10.1002/ajp.21016. Epub 2011 Nov 22. PubMed PMID: 22109938. Wynn JG, Sponheimer M, Kimbel WH, Alemseged Z, Reed K, Bedaso ZK, Wilson JN. Diet of Australopithecus afarensis from the Pliocene Hadar Formation, Ethiopia. Proc Natl Acad Sci U S A. 2013 Jun 25;110(26):10495-500. doi: 10.1073/pnas.1222559110. Epub 2013 Jun 3. PubMed PMID: 23733965; PubMed Central PMCID: PMC3696813.